For every cat owner, making sure their furry friend has a comfortable place to do its dirty business is imperative. A standard covered or uncovered litter box usually does a great job at this. But what if you are a frequent traveler and love to take your feline friend with you? Or are you moving cross-country and want to take the kitty with you? In this type of cases, you can’t rely on a regular cat litter box. 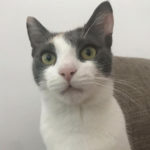 As you might have already gathered, portable cat litter boxes are compact, collapsible and packable cat litter boxes which provide a place for your cat to do her business comfortably. Portable cat litter boxes are also sometimes referred to as foldable cat litter boxes or collapsible cat litter boxes. Portable cat litter boxes come in two varieties: multi-use, fabric-based collapsible cat litter boxes, and disposable cat travel litter boxes. Even though portable cat litter boxes are available in quite a few shapes and sizes, they are generally smaller than standard cat litter boxes. Fabric-based portable cat litter boxes are generally made of heavy-duty Oxford cloth and can be easily folded to a packetable size so it can be easily stored in a car, cat carrier or in your luggage. Collapsible cat litter boxes are usually open or uncovered, though there are some that feature airtight zippered fabric as well. Fabric-based cat litter boxes are excellent for traveling or camping with your cat, and they can also serve as portable cat beds. Disposable cat litter boxes are made of biodegradable and eco-friendly materials like cardboard. The best disposable cat litter boxes are very compact, self-contained and can be re-packed, even though they don’t last more than a couple of uses. Disposable cat litter boxes are easy to use and require little care. Portable cat litter boxes are a perfect choice if you’re planning a long trip and want to make it more comfortable for both you and your feline friend. Some portable cat litter boxes have a zipper cover, allowing you to store cat litter while on the go. Portable cat litter boxes can also be used as makeshift litter boxes if you want to leave your kitty with a cat sitter. Let’s go more in detail about these key factors. The first thing you need to consider when browsing for a portable cat litter box is the primary purpose for which you are going to use it for. The intended purpose decides the type of the cat litter box you should go for. If you’re looking for something for a long road trip that will last for no more than a couple of days, then you can consider opting for a disposable cat travel litter box. Disposable litter boxes don’t require a lot of scooping and sifting and are also very portable. Disposable cat travel litter boxes are also perfect for emergencies and for housebreaking a new kitty. If your kitty likes to do her business in a more private more private atmosphere, disposable cat travel litter boxes come in both open and enclosed forms. If you’re traveling a lot with your kitty, then you should consider opting for a multi-use cloth-based portable cat litter box. These type of travel litterboxes can be cleaned, re-packed and very portable. Fabric travel cat litter boxes can also be used as cat beds. If you’re an air traveler, then you should definitely opt for a fabric cat litter box because they fit perfectly in a carrier and can be cleaned frequently. The other awesome thing about these cat carriers is that because of their waterproof fabric you get better protection from urination on the walls. If your cat prefers to do her business in a more private setting, you should go for an enclosed disposable cat litter box. The only alternative to this is fabric litter box or a hard-case. So, depending on your primary purpose, you should decide which type of portable cat litter box you should go for. The material that the portable cat litter box is built out of is the most important thing you should keep in mind before picking the best one. Even though all portable litter boxes are built with canvas or Oxford cloth, the quality of the material varies widely. The lighter the material, the less durable it is and the greater the chances of the litter box not holding up. When it comes to picking the best foldable cat litter box, the key factor you should be aware of is the waterproof liner of the interior. The liner must be not only durable but also scratch-proof so it can withstand your kitties’ deadly claws. You should look for a portable litter box that allows for easy maintenance and cleaning. 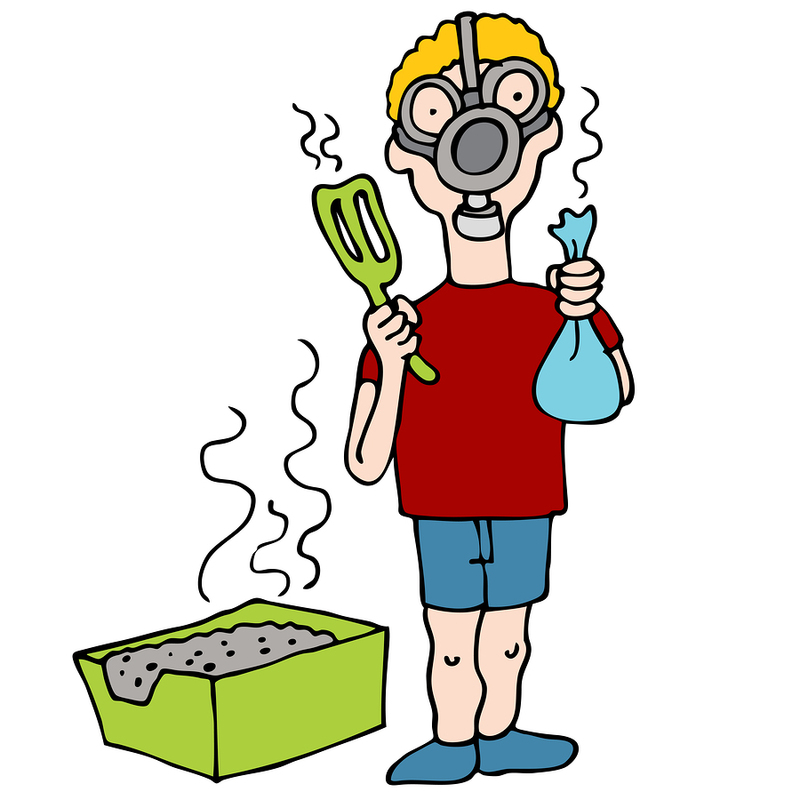 The portable litter box should be easy to clean with a sponge soaked with a mild detergent. Like we mentioned before, disposable cat litter boxes are generally built out of 100% recycled cardboard that is fully biodegradable and landfill friendly. When it comes to picking the best one, you should look for a model that has wax-based or other waterproof coatings on the inside. Even though disposable cat litter boxes are not as water-resistant as cloth based litter boxes, you should look for one that is able to withstand at least a couple of uses. Depending on the type of the portable litter box you are looking for, you should pay attention to the building material because it determines how useful a particular model is. Portable cat litter boxes are usually smaller in size when compared to standard cat litter boxes. There are some oversized models out there for kitties that are really big, so you don’t have to worry about not finding the one that can accommodate your feline friend’s size. The packing size is just as important as the dimensions. Fabric-based cat travel litter boxes are extremely portable and can be packed to a small size when not in use. However, this means that you will have to pack the litter separately unless you opt for a model that features a zipper cover. Enclosed disposable cat litter boxes are usually self-contained, meaning they pack in themselves. Open disposable cat litter boxes are also compact, but once assembled they can’t be used again. When looking for the best portable litter box, you should pay attention to both the overall size and the folded size because you don’t want to get a model you can’t easily pack. In addition to the key factors listed above, there are a couple of other considerations that can help you pick the best portable cat litter box. One of these factors are the accessories that a particular litter box comes with. While most products don’t come with any accessories, some come with useful items such as portable travel bowl and disposable scoops. Some portable cat litter boxes even come with a cat bed. The second factor you can consider is the color pattern of the litter box. Because the cat is the one that picks the litter box and not you, some designs may be more appealing to her than others. The last factor you should be aware of is the warranty and after-sales support. Even though portable cat litter boxes are not that expensive, you should be able to return one if your kittie doesn’t like to use it. Now that you’re equipped with the necessary knowledge you need to pick the best portable cat litter box, here is our list of personal picks. We hope you will save yourself some time browsing the internet for a model that perfectly fits your needs. Necoichy portable cat litter box is a perfect choice for those who are looking for a decently sized cat litter box that’s suited for travel. The Neocoichy is one of the best selling portable cat litter boxes because it offers a perfect blend of design and features. 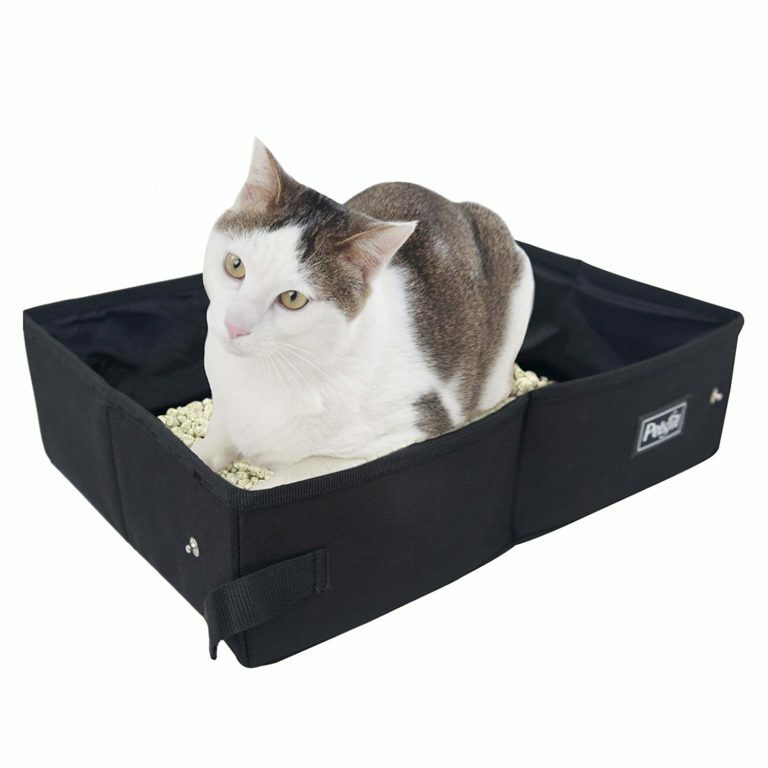 This portable litter box features a lightweight and durable Oxford canvas cloth body with a waterproof liner on the interiors. The waterproof liner is made out of Polyurethane is seamless and durable, and also provides protection from your kittie’s claws. However, this liner has its limits, so if you own a cat that’s overly aggressive, you’d want to add another layer of liner. The Necoichi portable cat litter box measures 15 x 10 inches, with side-walls measuring 5.1 inches. This litter box can easily accommodate a medium-sized cat, and thanks to high side-walls, you won’t have issues with cleaning the litter the kitty kicked off. The best feature of the Necoichi is its incredible compactness. It can be collapsed and to dimensions of 7.5 x 2.8 x 4.5 inches and comes with a snap-in strap. Folding is quite easy and convenient. Because this portable cat litter box is coated with a waterproof liner, it can be cleaned only by hand and air dried only. Te Necoichi portable cat litter box supports all types of litter including pine pellets, crystal litter, and standard clumping/non-clumping litter. If you are going to use this litter box for travel, we recommend you use a light-weight litter and make sure it’s not over-fill it with litter. Unfortunately, this portable litter box doesn’t come with any additional accessories like a collapsible water bowl, or a compartment for clean litter. However, when you consider how affordable it is, you won’t find another model that offers this much bang for the buck. Like all Neocoichi products, this portable cat litter box is quite affordable and comes with a customer warranty. Combine this with incredible durability and compactness, and it’s very hard not to give it a chance. Planning to go on a vacation or road trip with your cat, and you don’t have enough storage for all your a litter box and the litter for your cat? Here is a good solution for your problem. The IRIS Travel Cat Litter Pan is perfect for a long cross-country road trip with your cat. The IRIS Travel Cat Litter Pan is a product from the popular US brand for storage and pet products. The diameter of the litter pan is 15.5”, with 4-inch sidewalls, what makes this product suitable for kittens, small and medium-sized cats, and it is also a very compact solution for traveling. This litter pan has a decent quality round litter pan with a body made of canvas fabric, while the inside of the litter pan is coated with PVC. The PVC interior of the litter pan provides extra waterproofing and makes it, also, easier to clean after use. This portable litter pan has a zippered top cover, what allows you to store the litter inside it when not in use. Once you have zippered the IRIS Travel Cat Litter Pan, it is totally sealed, so you do not have to worry about something getting out. The litter box has two side straps on each side of the box, what makes it suitable for transport when filled. There are some complaints about this product, precisely its walls. The soft-sided walls can collapse when totally filled, which has sometimes lead to ”accidents”. But this problem can be easily solved with reinforcing the litter box with cardboard. This product works best with any litter that is lightweight. 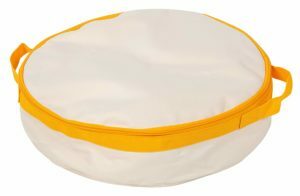 The IRIS Travel Cat Litter Pan is available in white with yellow linings on the side. This litter pan is a fantastic choice if you are planning to travel light with your cat. The IRIS Travel Cat Litter Pan is one of the best picks when it comes to sealable portable cat litter boxes, and is available for a price that fits its decent quality. Are you planning a long cross-country trip and want to take your cat with you? Or are you moving houses and need a disposable solution? The Kitty Kan Traveler disposable cat litter box might be the best choice for you, especially if your cat likes to do her business in a more private setting. This portable cat travel litter box is built out of recycled cardboard that is 100% landfill friendly, and on top of that’s made in the US. The interior is coated with a special FDA-approved 100% natural liner that makes the Kitty Kan Traveler waterproof and odor resistant. This portable cat travel box is quite large overall and can accommodate a medium to a large cat. The opening to the litter box is 7 inch in diameters so even if you have a big kitty, it will be able to enter the litter box comfortably. When fully enclosed, the Kitty Kan Traveler measures 19-inches tall which means you’ll have to set it up somewhere where there is ample space. This disposable cat litter box has a slightly better construction compared to its competition. The Kitty Kan Traveler is extremely portable and quite easy to assemble. The litter box is self-contained in its own box and can be collapsed for easy storage. 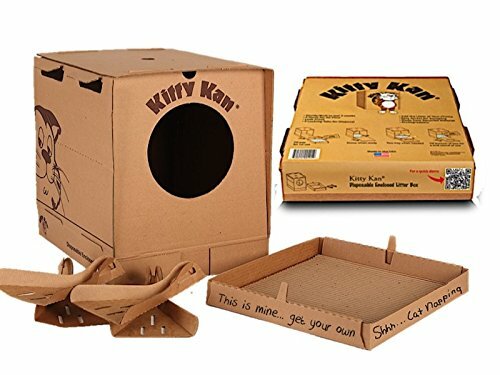 This disposable cat travel litter box is designed to be disassembled and re-assembled multiple times but after three to four uses the cardboard gets weak which can cause it to collapse when in use. 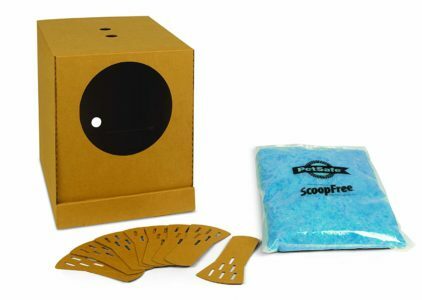 This litter box also comes with four disposable scoops for easy cleaning and sifting. And to make things even better, it even comes with a cat bed with soft cardboard rolls. You can also get this disposable litter box with or without kitty litter. The Kitty Kan Traveler disposable cat litter box is an excellent choice for those who are planning on taking their feline friend for a cross-country and need a disposable solution. Even though it’s more expensive than other disposable cat litter boxes, but other litter boxes don’t come with so many accessories. Do you travel with your feline friend everywhere? Do your travels include lots of plane travels? Then Petsfit foldable cat litter box might be the solution you’re looking for. This portable cat litter box requires no assembly, it just simply folds and unfolds. One of the awesome things about this product is that it comes in two sizes, large and extra large. So depending on how big your cat is, you have an option of choosing the size that fits her perfectly. The large model measures 15.7 x 14 x 4.7 inches when unfolded, and when folded measures only 8 x 5 x 2 inches. The extra large model measures 18.5 x 14.6 x 5.2 inches when unfolded, and when folded measures10 x 6.5 x 2 inches. As you can see both sizes are quite compact making this portable cat litter box an excellent option for air travel or hiking. The only issue we have with the dimensions is the height of the side-walls. Since the side-walls measure only 5/6 inches, you can expect that some of the litter will end up outside of the litter box. The Petsfit Foldable cat travel litter box is built out of lightweight yet durable 600D canvas fabric which is able to withstand a lot of punishment form your kitties claws. The interior is covered with a waterproof liner which is easy to clean. Because of this liner, this portable cat litter box can only be hand washed and air dried, so you better be careful when cleaning it. One other awesome thing about this product is that it can also serve as a portable cat bed. Since traveling can be exhausting for your feline friend and involves a lot of laying around, it’s not a bad idea to have a two in one solution. It would be awesome if this portable litter box came with a cover, but that would only increase its size. Made out of durable yet lightweight 600D cloth canvas. It’s available in two sizes. It’s extremely compact when folded, perfect for air travel. It doesn’t come with any additional accessories. If you are a frequent flier and like to take your cat with you, then Petsfit foldable cat litter box is a perfect choice for you. There aren’t many other products that are this compact, and there certainly aren’t many portable litter boxes that are this durable. If you are looking for a portable solution that requires very little maintenance, then Pet Fit for Life collapsible cat litter box is a perfect choice for you. This portable cat litter box is extremely sturdy, lightweight and portable. The Pet Fit Life collapsible cat litter box is built out of nylon fabric that is in itself completely waterproof. Of course, nylon is also very sturdy yet lightweight which ensures it is able to withstand quite a lot of punishment form your kitties claws. One more advantage of nylon fabric is that it’s very easy to maintain you can simply douse it in water and air dry it. You can even use disinfectants if you want, it won’t damage the material at all. This portable cat litter box is very portable. When folded, it measures only 8 x 5 x 2 inches, which is a tad larger than a smartphone. It can easily fit in your cat carrier or a side pocket of your carry luggage. The Pet Fit Life cat litter box comes with a strap-and-snap to keep it folded when not in use. Thanks to the strap-and-snap this portable cat litter box unfolds by itself to dimensions of 16 x 12 x 5 inches and can hold up to 5 pounds of litter. It is quite unfortunate that this model isn’t available in a larger size since the current model can only accommodate up to a medium-sized cat. The other thing we have a small issue with is that the side-walls are not tall enough to prevent your kitty from kicking of litter. 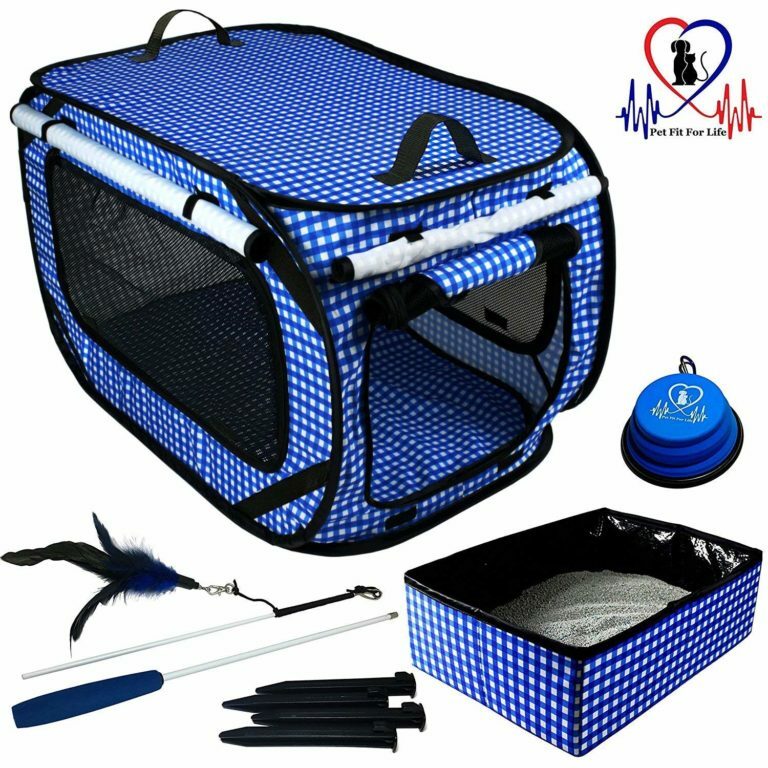 This portable cat litter box is available in a fancy, checkered-blue color and also comes with a collapsible pet travel bowl as a bonus. 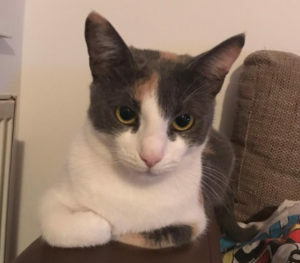 If that is not enough, the manufacturer has backed this product with a 100% satisfaction guarantee so if your kitty ends up not liking it you can return it with no questions asked. Built out of durable yet lightweight nylon fabric. Extremely portable since it folds to the size of a smartphone. The side-walls are not tall enough to prevent your kitty from kicking the litter out of the litter box. It isn’t available in multiple sizes. The Pet Life collapsible cat litter box is a perfect choice for those who are looking for a portable litter box that is able to withstand lots of clawing and is easy to clean. When you factor in that it is backed by a 100% satisfaction guarantee and a bonus portable pet bowl, it is very hard not to pass it up. If you are looking for a portable cat carrier that will both be extremely comfortable for your furry friend and very easy to maintain, then look no further tan PetLike collapsible cat litter box. This product is more than a litter box, it can also serve as a portable cat bed. 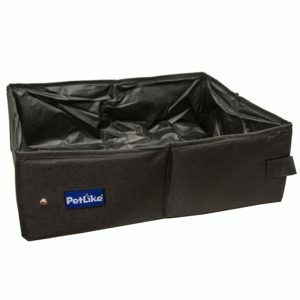 The PetLike collapsible portable cat litter box is built out of durable yet lightweight nylon fabric while the inside is made out of waterproof PEVA liner that is reinforced a seamless waterproof line. The PEVA liner is 100% pet safe and is quite resistant to your furry friend’s claws, so you don’t have to worry about it falling apart after a couple of months. The side-walls and the bottom of this portable cat litter box are cushioned allowing it to be used not only as a place for your kitties’ dirty business but also as a comfy cat bed. The PetLike portable litter box is very easy to clean using a damp cloth and some mild soap. This portable cat litter box is quite portable. When folded it measures only 8 x 5 x 2 inches and can easily fit inside a cat carrier pocket or your backpack’s side pocket. It unfolds by itself and is held together by a snap-and-strap when not in use. When unfolded, it measures 15.7 x 11×8 x 5 inches which is enough to accommodate up to a medium-sized cat. If you own a large cat she will have a hard time doing her business in this portable cat litter box, but she won’t have any problems with using it as a place to nap. The only issue we have with this product is that the side-walls are not tall enough to prevent your kitty from kicking the litter out, but that’s an issue with almost all open design portable litter boxes. Interior is built out of PEVA waterproof liner. Extremely portable since it folds to the size of a tablet. Doesn’t come with any additional goodies. Isn’t big enough to accommodate a large cat. The PetLike collapsible portable cat litter box is an excellent choice for cat owners that are looking for a product that can serve both as a place for kitties’ dirty business and as a comfy cat bed. It is competitively priced and built to last so there aren’t many reasons not to give it a try. PetSafe is a company that is well known for delivering high-quality products for your pets, and this disposable cat litter box is no exception. Even though it is a bit pricier than other disposable cat litter boxes, it comes with so many extra goodies that the price is more than justified. The PetSafe cat litter box is built out of biodegradable and 100% eco-friendly cardboard. The interior is coated with a special wax coating that ensures no leaks will occur. Since this portable cat litter box is built out of cardboard, you will be able to use it for only a handful of times before the cardboard becomes too weak in turn rendering the litter box unusable. However, this does not mean that this product is not worth your time. Because it features an enclosed design, it is well suited for kitties that like to do their dirty business in a more private manner. The PetSafe disposable cat litter box measures 16.4 x 12.6 x 14.5 inches, while the entrance hole is elevated in order to prevent any litter from escaping its confines. We wish that the manufacturer made the litter box a bit bigger so it can accommodate a large cat since there aren’t many portable litter boxes that are of this high quality. The best thing about this portable disposable cat litter box is the extra goodies it comes with. It comes with eight disposable litter scoops and a bag of premium crystal litter. This crystal litter absorbs the odors extremely well making it excellent for airplane travel. The scoops are, just like the rest of the litter box, built out of biodegradable cardboard are useful while you’re on the go, but we do recommend you opt in for a plastic scoop since the ones that come with the litter box aren’t good at scooping up poo. Since the entrance is elevated, your kitty won’t be able to kick off any litter outside the litter box. Comes with a bag of premium crystal litter. The cardboard scoops that come with this litter box aren’t that good at keeping the poo on them. If you want only the best for your kitty, then PetSafe disposable cat litter box is a perfect choice for you. This product is especially good for traveling with your kitty on a plane since you also get a bag of crystal litter that is incredibly good at keeping the odor in the confines of the litter box. The first thing you should know is: The fewer changes you introduce to your cat, the better. Because cats can be finicky about the fragrance and consistency of litter, make sure that you don’t change the litter. Buy the same litter that she is using at your home. This will increase the chances of your cat using the travel litter box. If your final destination is a house or a hotel apartment, you should consider confining your cat to just one room. By doing this, you will reduce the chance of your cat forgetting where you have placed the litter box. It is normal for cats to drink and eat less on the road then they usually do, so do not be concerned if your cat’s ”output” is less than usual. Even if your cat has an available litter box in the vehicle for the whole day, she will maybe choose to wait until evening to use it. This is totally normal, so you do not have to be concerned that something is wrong with your cat. When you have arrived at your final destination, the first thing you should do is to place the litter box and show it to your cat. If your cat hasn’t done her ”job” during the ride, place her in the litter box to encourage her to do it now. If you see your cat getting a little bit nervous, place her in the litter box because her nervousness could mean that she wants to pee. If you think that your cat won’t use the new litter box on the road, you could place the litter box in your home for a few days before the trip. If she is using it at home, she surely will use it on the road, because she will be already familiar with the new litter box. When compiling the list above, we gave our best at showing you the products that are both durable and useful. Since kitties can be picky when it comes to litter boxes, we decided to showcase you portable litter boxes of all kinds of designs so you can pick the one you think your kitty will find absolutely purrrfect. We sincerely hope you find our list useful. So what do you think about portable cat litter boxes? Have you ever used one during the travels with your cat? What is your favorite model? Let us know in the comments below!